You are viewing a 7" W x 5" H bird photography greeting card with a 5.5" W x 3.5" H original photo on a white background with a black border. The card is also suitable for framing. 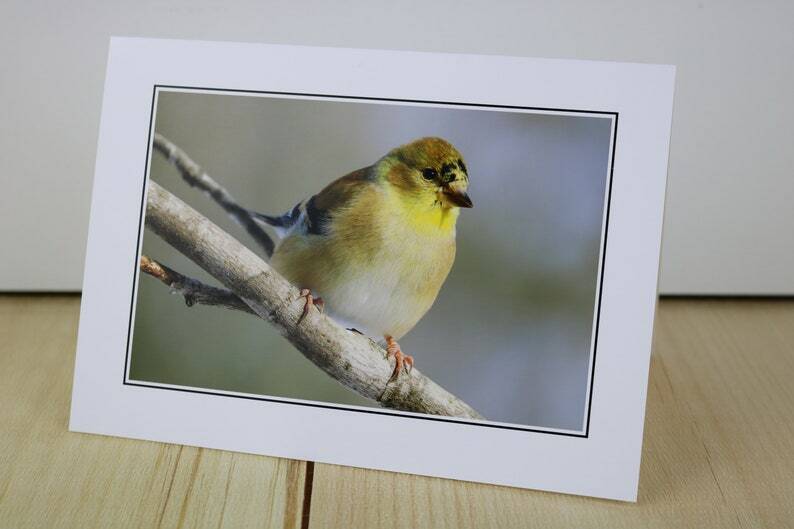 A unique single American goldfinch greeting card. Perfect gift for bird lovers! Printed on high quality Red River paper with a high gloss front and plain paper back. A7 - 7” x 5” acid free paper with a white sealed A7- 7.25" x 5.25" envelope is included with each card. The inside of the card is blank, making it suitable for any occasion. The inside is also a matte finish for easy writing. Original photograph taken in the great state of Maine. The card is carefully packaged in a protective ecoclear sleeve and shipped in a recycled-paper rigid mailer. The quality of this photo is exquisite. Besides being a beautiful nature photo, it's just adorable. I plan to order more as I think these will be great to keep on hand for any occasion cards, including sympathy, thank you, etc. Item shipped quickly and in a protective envelope. Looking forward to seeing more from this shop and ordering more as I might keep this one for myself!